Found footage and archive images, split-screen or a multiplication of the image on screen, a replacement of the original soundtrack with commentary, a detached voice-over alternating long/silent sequences, an explanatory use of info-graphics and tracking technologies. These elements feature in Harun Farocki’s work on surveillance – work ranging from documentary films to video installations that constitutes a complex imagery based on practices of watching and being watched, control and the gaze, triggered throughout private and public spaces. As in any attempt to analyse surveillance practices such a scenario implies a mention of its arch-theorist, Michel Foucault. Without dealing thoroughly with a presentation of the panopticon model, the disciplinary suggestion of a powerful eye watching us, the connection between sight and power and therefore the effort to maximise, optimise, and enhance vision by means of sophisticated technologies represent important elements in Farocki’s depiction of surveillance practices. The director approaches the elaboration of such mechanisms in two ways. He proposes a strong thematisation of the ideology of crime prevention and its techniques that now have been transferred to other fields. The centre of attention here is the proliferation of surveillance technology in our age with the result of a widespread expansion of surveillance phenomena both in the social and the visual space as an accepted, almost naturalised, part of contemporary experience. Also, Farocki’s works take advantage of the hyper-saturation trend that involves surveillance images and weaves them into the visual texture of experience, legitimating their belonging to what could be defined as the expanded 21st century ‘videosphere’. I suggest considering these two points as consecutive steps along a trajectory that starts from the observation of reality and ends with a linguistic reflection: depicting surveillance, its practices and uses (level 1), leads the director to a first-person experimentation of its dynamics (level 2) and to a broader understanding of its rules and essential elements, which are then compared to the principles and components of cinema (level 3). Therefore, Farocki’s artistic research ultimately allows a parallelism between the disciplinary and (later) control society scheme and the structure of the cinematographic apparatus, which I would see as the ideal end of the mentioned trajectory. Engaging in a reflection on surveillance does not simply lead Farocki to focus on how the balance between seeing and being seen is organised or tends to change, rather it actually opens up a wider observation about the politics of the image, considering the production of traceability, and questioning the relationship between visibility/governance. These issues make him a filmmaker with a keen interest in the concept of the trace that is thus profoundly interlaced with his production. In particular, the three stages of his reflection (mirroring the three-level trajectory I sketched) can be intended as subsequent degrees on which the topic of the trace is tackled. On a most basic and explicit level some recent works address the idea of the trace from a point of view that makes an inquiry into contemporary surveillance culture. Visual media practices such as CCTV and technological systems involve the production of moving images for controlling purposes and examine what is a complex ensemble of traceability dynamics, where space is shaped after criteria of measurability and exploitability of traces. On a deeper analytical level some other works show how Farocki avails himself of the typical codes and style replicating the mechanisms that characterise the surveillance effort in contemporaneity, disclosing the connection between surveillance and cinematic practices in terms of production and functionalisation of traces. On a third level some films and video installations allude to the relationship between the notion of the trace and the filmic medium; in this sense trace, index, presence, absence, ephemerality, and persistence are keywords of a meta-discourse that considers the moving image in its relationship to reality and its connection to the photographic realm, particularly in its shift towards digitisation. I will follow these steps in order to examine the bridge between the suggestion of surveillance and the concept of the trace in Harun Farocki’s work. His production may be a guide to understanding which kind of experiences of our daily life are to be traced back to surveillance processes, where the prism of surveillance imagery intervenes in our representational and aesthetic practices, and how it contributes in structuring the contexts of our experience, in determining and channelling its flows. A first and very clear example of Farocki’s interest in surveillance practices is to be found in Die Schöpfer der Einkaufswelten / The Creators of the Shopping Worlds (2001). This documentary illustrates what would generally be seen as a very familiar context: the shopping mall. The director focuses on the dissonance between shopping as an everyday experience and the complex planning process that lies behind it. An army of planners, managers, consultants, and analysts oversee the designing of shopping malls. The camera explores the logics guiding the experts, showing how the organisation of these buildings is inspired by a sophisticated relationship between the gaze and movement throughout space. Central questions considered by the author are: how does the attention to the disposition of space match with the surveillance element, and how does the latter unfold? Is it simply a matter of cameras located in strategic places? Apart from the presence of CCTV systems connected to a classical security purpose, a deeper sense of control marks the shopping mall in structural terms. More precisely, architectural images are coupled with those images produced in the building by surveillance systems, showing how the idea of control itself works ex ante as an inspiring principle in the planning and design phases of the context. This is the reason why, once released, the building represents a place where the surveillance attitude can be exercised not only by watching but also by manipulating the gaze and the mobility of subjects. Issues such as where the gaze of a customer falls and how a ‘spontaneous’ purchase can be induced are at the heart of the designers’ concern as well as of the director’s unveiling action. Fig. 1: Representing surveillance in Die Schöpfer der Einkaufswelten. The issue of surveillance is presented here in its connection to consumption, clearly shifting from a discipline model (Foucault) to a control one (Deleuze) where punishment seems to be replaced by the logics of capitalism. In this perspective the exercise of control contributes to the perpetration of a surveillance discourse expressed through a subtler attitude. Farocki shows how shopping mall managers look at these places when they want to find out how consumers relate to the space, how they move, where they stop, and what itinerary they follow in order to reach a certain item. For this reason the planning strategy is based on a wide range of tracking systems such as track counting and eye tracking software, which enable the architects to inform, dispose, articulate, or re-organise space after the monitored data. This is an important point because it underscores how the construction of lived spaces and experiences are structured by surveillance imagery. In this way an everyday cultural act like shopping turns out to be a highly-controlled experience; the shopping mall resembles a contemporary, leisure, consumer version of a high-discipline environment. What Farocki provides is a description of surveillance culture, reporting on its mechanisms and its contamination of daily practices. The depiction of the venues of surveillance culture is characterised by the director’s ability to convey a deep sense of shadowing that is procedurally enabled by the collection of data and information concerning the subjects, their movements, attitudes, and preferences. In other words we are presented a representation of surveillance supported by a meticulous archival activity that works as its backstage and which is also depicted on screen. Significantly, the software and techniques filmed by Farocki thematise a connection between the practice of tracking and the concept of the trace: the surveillance discourse puts forth a classical reference to a literal way of thinking control, where detectable evidence is seen as proof – but at the same time and in doing so the collected material highlights that the evidence are traces caught in their nature of symptoms. Revealing themselves as marks left by something or someone these traces suggest a presence belonging to the past, which produces a substantial absence in the present; this opens up a symbolic universe whose pregnancy relates the idea of a trace to that of a sign. Already at a first descriptive level Farocki’s attitude towards surveillance and its connection to the notion of the trace seems to allude to the dense linguistic and philosophical insight of this category. Going through these issues would be a fascinating challenge but would not be coherent with the aim of my text. Leaving the task to a more proper context and maybe to a more experienced pen, I would nevertheless identify two co-present conceptions of the bond surveillance/trace: the director proposes a paradigm of clues, followed by the creators of shopping malls to study people’s tracks in order to take advantage of them and to maximise profit; and a paradigm of writing, referring to the ideal imprints left by the subjects on space, which emphasises the aesthetic value of a gesture – be it walking or simply ‘being there’ – and eventually evokes the domain of images. The first model betrays a quite direct adherence to the universe of investigation, aligning it to the traditional panoptic model in which the disciplinary aspect decided whether the subject should be under the eye of the controller or not. Having put aside the punitive element the clues are now associated to a free access situation and, most important, to a context that we are finally free to leave whenever we want. Severity and constraint seem to give way to a more ‘positive’ atmosphere, where on the contrary a controlled ecosystem ‘naturally’ leads us towards a certain product and solicits our economic power, possibly assuring a kind of gratification derived from the purchase. In such a frame the presence of CCTV does not make us feel hunted down by a Big Brother and surveillance processes are triggered either discreetly or in a way which is so explicit that they become paradoxically invisible: control technologies such as tracking systems are declared at the shopping mall entrance but they are not evident throughout the environment. The collected traces visualise the behaviour of the subjects, intruding in their life to produce a strategic intervention which is almost not perceived – and even when perceived, it is considered part of the space, a completely normal element taken for granted. As the lines highlighting the path of the consumers vanish on screen the sensation of being controlled softens, no matter if these traces are recorded and stocked for market survey purposes. The image of this mark left as the moving crystallisation of a temporary presence shifts the focus onto the second model. The trace of the subject, of his or her movement and gaze, are turned into a sign, a form of writing able to provide a shape. For this reason I would argue that on the first analytical level Farocki’s representation of surveillance puts forth a representation of the trace as well. Such depictions are the starting point of a wide range of visual renderings produced using further elaboration tools that also feature other video art works by the director. In this vein Farocki plays with specific techniques, shifting from the position of the observer who witnesses the surveillance effort and unveils it, as it was in Die Schöpfer der Einkaufswelten, to an ambivalent role in which he does not cease to sketch surveillance but at the same time plunges into the dynamics he is exploring and assumes their codes and procedural rules. The massive presence of info-graphics overlapping the image in the installations Gegen-Musik / Countermusic (2004) and Deep Play (2007) are emblematic in this sense. representations aimed to regulate the traffic, by car, train, or metro; representations released to determine the height at which mobile phone network transmitters are fixed, and where the holes in the networks are. [And again –] Images from thermo-cameras, used to record heat dispersion from buildings and [people gathered at] meeting points. In all these cases Farocki emphasises the quantitative dimension describing the reality displayed on screen, superimposing a diagrammatic version of the image on it. Such an elaboration of found footage of security and monitoring videos goes beyond representation, expressing the artist’s aim to question vision in depth in order to identify its mechanisms, to systematise and understand them fully. For this reason Farocki mixes some footage he shot himself with the heterogeneous materials collected in the installation. He focuses on images connected to a couple of hot-spots in the new business area in Lille; on these very images he resorts to the same informational graphics used by municipality authorities, institutions, and agencies of control, building up a sort of contrapuntal view. As in a deconstruction of the visual pattern presented on screen, referent and image are treated as distinguished layers posed one over the other; in associating these layers the director makes clear how the ultimate meaning is to be captured after a process of interaction among the different visual levels. 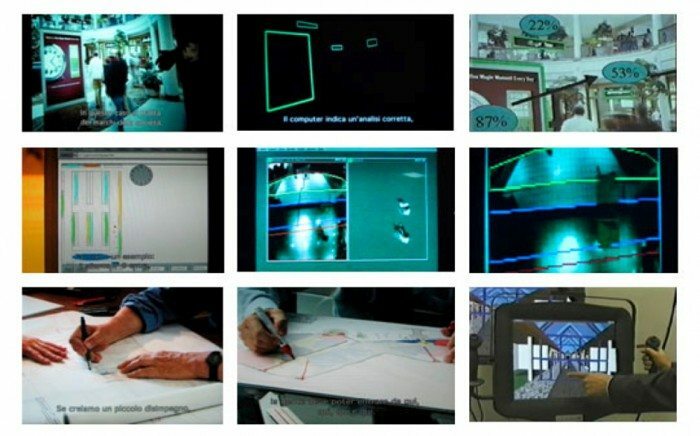 The use of visualising techniques generally applied for control purposes becomes a strategy to examine surveillance culture not only through observation but also by means of a more direct experimentation with its tools. Figs 2, 3: Reproducing surveillance in Gegen Musik. This results in specific aesthetics that mix different visualisation and representation sources. Cars on the streets, children in their beds, and people gathered in meeting places are monitored and studied in order to infer a series of references and data concerning the environmental conditions surrounding them, the relation they have with the people around them, and sometimes physical and physiological values (temperature, pulse, etc.). A grid based on this information is elaborated, systematising the gathered traces and considering them functionally for statistics or control purposes. This does not only show the rationalisation degree of the contemporary experience but rather the collection of paths and transit charts, people concentration schemes, movements, patterns and so on that seem to be functional to a ‘surveillant assemblage’ – meaning a multiplicity of heterogeneous elements that work jointly in the exercise of surveillance. The same is valid for other spaces of everyday life such as sport venues. In Deep Play a complex net of abstract computer-generated representations of the flow of play covers images of football matches. 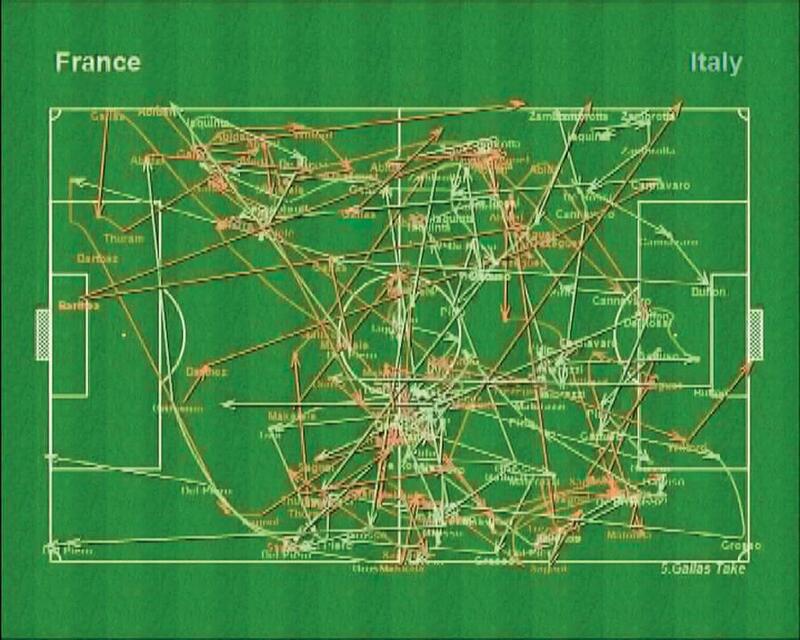 The editing process contributes to convey the same intricacy too, since the installation encompasses heterogeneous materials including: the official footage of the France/Italy match during the 2006 FIFA World Cup, the director’s own footage of the game, stadium surveillance images, real-time 2D and 3D animation sequences, and charts of player and tactical stats. Taking advantage of the ‘moviola effect’ often proposed to football spectators, a procedure similar to the one used in Gegen-Musik is presented here at a higher degree of sophistication: the acts of passing, kicking, and receiving the ball are partially screened in slow motion but above all they are tracked, leaving a labyrinthine mark on the playground. Even the excited gestures of the coach are isolated by the director and copied as a transcription over the stadium views, giving birth to a particular map almost looking like a mixture of choreography and painting. Figs 4, 5: Reproducing surveillance in Deep Play. On the screens basically everything that happened in the 90 minutes of the match is noted on the surface of the image, which proposes an intricate field of phosphorescent traces crossing one another. An appositional mechanism produces a superimposition where background images and graphic visuals are to be considered as layers that are fragmented in order to be understood and recomposed. Such a fragmentation is released by the director thanks to the monitoring tools that we already saw in use in the shopping malls and the city to track people, places, and flows; aiming for a full and deeper sense of the phenomena he explores, Farocki follows these examples, employing (and thus reproducing) the same control-monitoring-tracking techniques. After a representation of control-oriented systems Farocki’s artistic research shifts to a second level that I would define as a way of replicating surveillance. This replica enables the author to reconfigure the scene, having examined its elements and the vectors regulating the relationships among them. Compared to the description phase this process represents a more profound reworking of the image because it implies a sort of appropriation of the dynamics and logics of surveillance that are subsequently used for the composition of the installation. 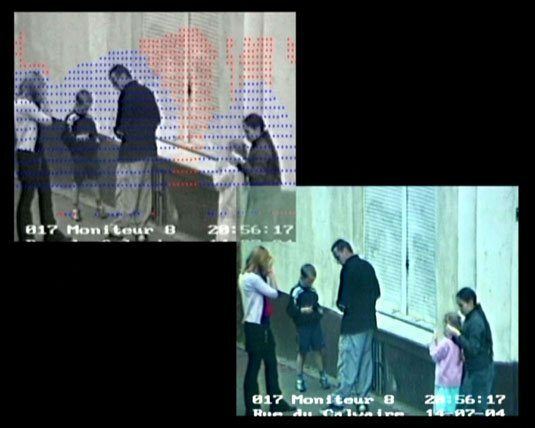 Farocki enters into the mechanisms of surveillance to exploit them, and in exercising it he directly encounters the notion of the trace – for he effectively exercises a tracking activity too. The result of this two-fold operation is a sort of mise en forme of the surveillant assemblage. The info-graphics and the charts work as a data-layer spread on the surface of moving images according to their variation. The idea of the trace as a deposit that allows a stratification of subsequent sedimentation suggests the possibility of seeing it not only as a figure of writing but also as a composite sign produced by the crystallisation of multiple writings and re-writings that are finally bundled. Farocki designs a superimposition of visual and filmic traces, playing a first-person role in the reproduction of the ensemble of procedures ruling the contemporary society of control. In adopting its typical practices he becomes the conscious exponent of a form of monitoring that performs and critically perpetrates its principles. The step after representation is then an authentic, strategic production and functionalisation of the trace. In the resulting ‘aesthetics of layering’ the tracking action is triggered with the aim of exploring, manipulating, exploiting, and displaying the discourse of surveillance. In this sense the high degree of traceability of the subject poses the conditions for a huge quantity of information made available, enabling practices of governance. The creation of databases thanks to image and information-storage procedures gives rise to dataveillance. Such a collecting practice has ancient roots, but in the information and digital age its developments obviously increased exponentially, turning isolated collections of records into massive integrated networks of information used in data mining. In reinvigorating the connection between power and knowledge via the eye/vision typical of surveillance Farocki underlines the necessity of traces in this replicating scheme I sketched. As the first visual output of the controlling activity traces become the double of the subject, putting a number of data into play that give an account of his or her movements, habits, and lifestyles – but, most radically, of her or his presence or absence, permanence or ephemerality, real or virtual quality. Taking into consideration the devices appearing in the installation series Auge/Machine I-III / Eye/Machine I-III (2001-2003) art critic Hal Foster observed these instruments are indicative of a shift in the balance of the elements primarily involved in the practices of seeing, and consequently in surveillance. According to him this passage is at the centre of the director’s attention: ‘like Michel Foucault and Jonathan Crary, he suggests that each new relay involves a new regime of the subject as well’. I would connect this idea to the importance of data and therefore to the centrality of a regime of the subject based on information. This is something pertaining to aesthetics but, more radically, I would allude to the creation of ‘data-selves’ and to the ‘generative activity of the dataset’. Those traces which we can easily recognise in both Gegen-Musik and Deep Play are an ensemble synthesising the gathered data on a subject; they are comprehensive imprints entailing a large amount of information. Such great attribution of value tends to pauperise the subject as ‘original’ and, in turn, elevates his or her trace. Fostering a progressive and paradoxical separation between the trace and the real subject originating it, data-selves are based in fact on an abstraction process that favours the production of ‘digital personae’. These can develop independent ‘data-lives’ and can be perceived by the watcher as an autonomous, self-subsistent entity. The risk posed by this virtual life of the filmic trace is to mistake it for the subject, confusing their ontological nature: the former lives simultaneously on presence and absence and is set in a dimension between past and present that I would define – borrowing Georges Didi-Huberman’s formulation – as the dimension of ‘restitution’. Though living in the depth of the videosphere – that is to say, within a cultural atmosphere – which is hyper-saturated with surveillance imagery the latter is not made of celluloid nor of bits, and he belongs to the present, living dimension of experience. The watched subject can also elaborate his or her own presence according to the presence of the control devices. In the frame of a spectacularisation model she or he could react to the mechanical eye not simply by avoiding it or hiding from it but rather performing before it. Farocki reconstructs possible examples of these risks in his ‘prison cycle’. Works like Ich glaubte Gefangene zu sehen / I Thought I was Seeing Convicts (2000), Gefängnisbilder / Prison Images (2001), and Erkennen und Verfolgen / War at a Distance (2003) couple images showing the perpetration of historically-established mechanisms of control and sequences dealing with contemporary tracking, scanning, and monitoring techniques that show new ways to confront the condition of (forced) visibility imposed by contemporary experience. Such works offer a rich critical reflection on ‘dataesthetics’ as it is conceived by the most recent data studies. Farocki mixes a selected iconography of the prison along with found footage material from CCTV and movie sequences, putting together a rich reflection on surveillance practices that becomes much more explicit and focuses the reactions of both the watchers and the watched to a control machine that intertwines classical disciplinary modalities and contemporary dataveillance. In Gefängnisbilder the director introduces us to the equipment used to control the convicts in the Corcoran penitentiary in California. The voice-over explains that each and every move is recorded by the surveillance system so that basically everyone entering the walls of the prison is exposed to a constant gaze. Such a gaze aims to gather information by observing, following, scanning, and filming the subjects by means of the technologies we already know from the commercial, urban, and leisure contexts. According to this policy recreation time is also intended by the guards as an important moment to collect sensitive data about the prisoners. Interaction among inmates, suspect exchanges, and contacts are carefully watched and noted in order to define gang affiliations, rivalries, etc. This information is used to keep the situation safe, but sometimes is instead exploited for absurd purposes. A board with prisoner mug shots is maintained in every shot-unit office. It shows the prisoners’ tier assignment and group affiliation. The guards also influence the level of yard violence by moving inmates around in their units and selecting who goes to the yard together. Guards can pick a particular eme, or Mexican mafia member, to go to the yard with a member of nf, or nostra familia, both [have] been rival groups as far back as the 1960s. Or they could pick an sm, a Southern Mexican, to go to yard with a rival Northern Mexican. Combinations such as these have resulted in matching a fighter favoured by staff, teaching an inmate a lesson by placing him on the yard with a more powerful opponent, or competitive match-ups for staff betting. The compiling activity based on observation and data elaboration produces a visual database that turns the subjects into the information gathered about them: for the shot-unit members inmates are identified just as ‘eme’, ‘nf’, ‘sm’, or ‘nm’ – they are a piece of information whose consistency is perceived looking at the board or on the CCTV screens. Figs 6, 7: Sublimating surveillance in Gefägnisbilder. Traces collected as data or marked as signs by the tacking tools are not just the residual symptom of the subjects – on the contrary, they are made their substitute. Seen in these terms the bodily presence and the human volume of the convicts are flattened to a notice written on paper or a filmic line temporarily appearing in the frame. 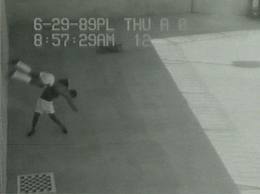 Recalling an experimental procedure in the 1970s by video artists such as Dan Graham or Bruce Nauman, Farocki’s contribution to such a tradition and to data aesthetics fosters a production of surveillance images which promotes a separation removing the subject from himself and inevitably dissociating him from his image. At the same time, and in the opposite perspective, recreation time in Corcoran is considered by the convicts as a moment to reveal their full being as individuals; it is an occasion to display their gang ties despite the surveillance measures, to show their status among their comrades and their bravery and power towards the institution. As Farocki’s commentary recalls inmates ‘have nothing but their bodies, and their membership [to] a gang’. Hence, the exposure to the eye of the camera becomes a way to affirm oneself in a sort of performative attitude that becomes the main feature of the subject’s behaviour. Also in this case the trace turns itself into proof of existence and becomes the characterising mark of the subject – a sign as guarantee of the person. This is actually what happens to William Randall: after a fight with Frederico, a member of an opposing gang, Randall kept on quarrelling with him in the yard. The verbal warnings of the guard did not stop him; apparently, only the shot-unit could make him desist. The result was the death of the prisoner which is presented by Farocki in the same way as the guards processed it: a figure on the screen moves in the space of the frame and after a while it just stops; the image lingers and so does the trace of a person who was killed in the meantime. The decision to be caught by the eye of surveillance even at the risk of one’s life, and to basically act in front of it, betrays an interesting attitude towards the controlling device and possibly reveals once more the connection to the idea of the production of a trace. Interestingly, this time such creation is activated by the watched instead of the watcher, and thus it seems to respond to a tactical rationale. As Farocki’s voice-over tells us, William behaves as if he was a gladiator; he plays the role of the warrior and in so doing he proposes a spectacularisation of reality. The prison yard turns into a stage for his deadly performance, articulating the space according to his manner of inhabiting it. Such an attitude towards CCTV directly recalls what Hille Koskela argues about control practices enabled by webcams: ‘[w]hile being seen may be unpleasant for some, others are eager to increase their visibility.’ Similarly, even in the penitentiary the surveillance device is not necessarily interpreted as a threat but rather is conceived as a medium giving the ‘chance to display oneself under the gaze of the camera’. Randall is not seen as less powerful just because he is watched by the guards, as it would have been in the panopticon; on the contrary his value seems to be connected to the fact that he deliberately made himself visible. I believe an issue of desire is what mostly characterises CCTV images here – the desire to be seen, to be included in the scopic field, not to be forgotten, to be taken seriously, to prove one’s own fearlessness, to exhibit oneself, or even to react to the surveillant assemblage. In consigning his trace to the surveillance discourse Randall is shot to death, but in paying this price he produces an image that will somehow make him immortal. Attempting to reveal the possible reaction to control systems applied to contemporary detention centres, Farocki moves a step further in his reflection on surveillance: the representation and the reproduction of control dynamics lead to a deeper consideration, where the depiction and strategic/tactical production of traces are the metaphors of a progressive gain of awareness related to surveillance, to the mechanisms guiding its devices and – above all – to the connection between them and those regulating the moving image. He finally makes very clear the importance of the trace as the sign of a presence able to overcome space and time constraints and to survive as an image, which at the same time is based on an essential absence of its referent. Such an ambivalent nature resembles the irreducible difference distinguishing subject and trace. Focusing on the visualisation, creation, functionalisation, and mental elaboration of traces, the director legitimates a more general, linguistic, meta-discursive reflection about the character of surveillance images and the perception of audio-visual images tout court. Farocki’s observations seem to tackle this topic, reserving particular attention to the digital image and to the changes that occur in seizing it after digitisation. If the classical surveillance model relied on the scopic power of the watcher emphasising the separation between him and the watched and adhering to the general phenomenological principle that to see is ‘to have at a distance’, contemporary surveillance devices are able to employ such a detailed, close, endoscopic view, basically deleting the distance. To see is now to have something far away reducing – or possibly, killing – the distance, but preserving at the same time the detached, safe position of the observer. I am not arguing here that the surveillant eye renounces its strategic position; rather, I see this aspect as a further step in the negotiation of the roles characterising surveillance discourse brought about by the broadening of the phenomenon. The increasing integration of images in the spaces we inhabit and its dwelling power (think about tools such as Google Glass) forward a strong ability of the image to delete the distance both in physical and in ontological terms. This process creates an immersive environment, triggering a sort of compression in space and time; furthermore, it does not only represent a technique in managing the digital image but also describes a real texturisation of image and space in our way of framing certain phenomena such as surveillance – we perceive surveyed space through the images of it and vice versa. Similarly, the subject and his image are reunited in the trace that works as a synthetic version of them. As the story of William Randall highlights the concept of the trace becomes the clear joining link between these dynamics. On a third analytical level its centrality points out what I would define as a sublimation of surveillance and consequently as a sublimation of the trace. This final phase of the trajectory I identified resumes Farocki’s rich theoretical research, anchoring it to its own practice of filmmaking and making explicit a parallelism between the surveillance/dataveillance and materiality/intangibility of the cinematic image. The broadening of surveillance technologies and practices, the evolution characterising their processes, the way of conceiving and conceptualising them, their engagement modalities and the effects on the space of experience they create in contemporaneity, lead to a new map of the phenomenon. It is a complex and fascinating universe that I tried to approach moving along a specific path. Farocki’s work represents an interpretational device as it guides us through the facets of the contemporary surveillance scenario, simultaneously developing a meta-cinematographic reflection on the image. Through the prism of his camera we are presented with what seems to be different strategies in the way of thinking and approaching surveillance that I would systematise as follows. Next to the common and most traditional use of CCTV and visual control systems for disciplinary purposes it is possible to identify a set of new fields structured after the exercise of a hegemonic Big Brother. In this perspective contexts of consumption and urban spaces represent an emblematic example of a mechanism that could be described with good reason in terms of metabolisation of surveillance in the frame of social, cultural, and symbolic practices. Media play a crucial role in these dynamics since they subsume and deliver surveillance imagery, promoting a wide discourse of control characterised by negotiable procedures rather than a pure, imposed, institutional system. Farocki puts these processes at the centre of his artistic research, devoting different films and video works to them. His way of considering the surveillance issue can be reconstructed as a three-step effort in which each phase highlights a particular strategy adopted by the director to get a progressively fuller picture of the phenomena he explores. First, a depiction of controlling practices and monitoring techniques enables Farocki to represent surveillance and to draw the first basic connection between it and the concept of the trace; sketching surveillance implies a visualisation of vectors and images that put into play this dense and meaningful concept. In this first approach to the phenomenon we can recognise an attempt at giving a shape to it: I called this step the representation of surveillance – an operation that also implies a representation of the trace. Second, the artist adopts the dynamics he observed and described in order to seize the ruling principles and the procedural logics of what he represented before. I named this passage a ‘replica’ of surveillance because Farocki reproduces the roles and the (in-)/visibility balances, the actions and the gaze trajectories typical of a control society. In doing so he poses himself behind the camera unfolding a strong power of the eye that symbolises and perpetrates the same processes featuring the predominant position of the watcher over the watched. In other words we are presented images of surveillance recorded from a strategic point of view, released thanks to the tools at his disposal to create and gather information about the surveyed subject – replicating surveillance allows collecting the traces of the observed person and therefore replicating his trace. The large use of data, the sophistication of the recorded information, and the desire to manipulate imprints (i.e. tactical production of one’s own image/trace) suggest a third step in the study and the elaboration of the examined scenario that I defined as the sublimation of surveillance. The explication of this complex phenomenon underscores the perceived proximity of the observed subject and his or her trace, determining a superimposition of conceptual layers that confuse him or her with its index. In such a perspective the condition of existence of both seems to be exposed to sublimation because during this process their nature is transformed almost ‘alchemically’, introducing a shift in their ontology. The operations of representing, replicating, and sublimating the imagery and the figures connected to surveillance can be seen as strategies adopted by the director to tackle this topic and to develop a personal restitution of its forms. For this reason I would suggest considering them as intertwined modalities of expression converging within what could be defined as a Farockian poetics of the trace. As we have seen, and taking into consideration only some, such aesthetics are to be deduced from a wide range of productions conceived for the movie theatre and from a number of gallery films that give an account of the contemporary politics of the trace. Reflecting on the way of structuring his cinematographic aesthetics of surveillance Farocki appears provocative as well as engagé and provides a dense interpretation of practices that feature everyday life in both an acclaimed and a subtle way – practices that draw our attention to the production and the consumption of images and determine not only the regime of vision but also the condition of the subjects involved in the scopic activity. If ‘the relevant question about surveillance today is not whether we should live in a surveillance society, but how’, then Farocki’s work answers in all its fertility, radicalness, and ability to raise concerns about this very issue. The figure of the trace reinforces this consideration and somehow metaphorically renders the director’s style. His cinema ‘offers something to look at and links what is seen to experience. It connects levels of time and meaning, on and beside the screen’, reframing them within the delicate area between consistency and ephemerality, between presence and absence. Miriam De Rosa received her Ph.D. at the Catholic University of Milan in 2011 where she now collaborates on the research activities of the Department of Communication and Performing Arts. Her studies focus on cinema and visual arts with particular regard to the relationship among subject, space, and filmic device. She has written diverse essays on these topics collected in Italian and international anthologies and she also wrote the book Cinema e postmedia. I territori del filmico nel contemporaneo (2013). De Rosa currently teaches audiovisual cultures at the Catholic University of Milan and cinema, photography, and television at the University of Insubria in Como. She serves on the NECS Publication Committee, co-edits the NECSUS exhibition review section, is general secretary of IMACS (http://imacsite.net), and co-directs Screencity Journal (http://screencitylab.net/journal.html). Bentham, J. Panopticon: Or, the inspection house. London: Payne, 1791. Blumenberg, H. Shipwreck with spectator: Paradigm of a metaphor for existence. Cambridge: MIT Press, 1997. Büttner, E. ‘”They don’t do anything old anymore. But time keeps rolling on.” New pictures by Harun Farocki’ in Nebeneinander, edited by H. Farocki. Vienna-Cologne: MUMOK/Verlag der Buchhandlung Walther König, 2007. Clarke, R. ‘Information technology and datveillance’, Commun. ACM, No. 5, Vol. 31, May 1988: 498-512. _____. ‘The digital persona and its application to data surveillanece’, The Information Society, No. 10, Vol. 2, June 1994: 77-92. Debray, R. Vie et mort de l’image. Paris: Gallimard, 1992.
de Certeau, M. L’invention du quotidian: I Arts de faire. Paris: Gallimard, 1990. Deleuze, G. Cinema 1: L’image-mouvement. Paris: Minuit, 1983. Deleuze, G. ‘Post-scriptum sur les sociétés de contrôle’, L’Autre Journal, No. 1, May 1990, subsequently published in Pourparler 1972-1990. Paris: Minuit, 1990: 240-247. Derrida, J. De la grammatologie. Paris: Minuit, 1967. _____. Marges – de la philosophie. Paris: Minuit, 1972a. _____. La dissemination. Paris: Seuil, 1972b. Didi-Huberman, G. Génie du non-lieu: Air, poussière, empreinte, hantise. Paris: Minuit, 2001. _____. L’Image survivante: Histoire de l’art et temps des fantômes selon Aby Warburg. Paris: Minuit, 2002. _____. Remontages du temps subi: L’œil de l’histoire, 2. Paris: Minuit, 2010. Elsaesser, T (ed.). Harun Farocki: Working on the sight-lines. Amsterdam: Amsterdam University Press, 2004. Farocki, H. I believed to see prisoners/Eye in Ctrl [Space]: Rhetorics of surveillance from Bentham to big brother, edited by P. Wiebel, T. Y. Levin, and U. Frohne. Karlsruhe-Cambridge: ZKM/MIT Press, 2002. Foster, H. ‘Vision quest. The cinema of Harun Farocki’, Artforum International, November 2004: 156-161. Foucault, M. Surveiller et punir: Naissance de la prison. Paris: Gallimard, 1975. 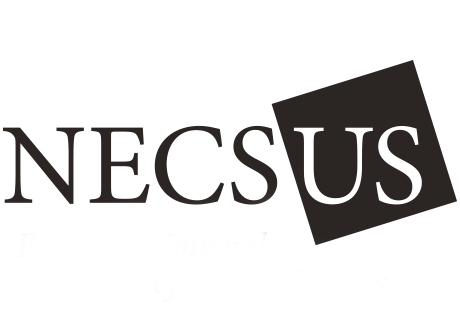 Fuller, M. Media ecologies: Materialist energies in art and technoculture. Cambridge: MIT Press, 2005. Fuller, M. and Goffey, A. Evil media. Cambridge: MIT Press, 2012. Haggerty, K. D. and Ericson, R. V. ‘The surveillant assemblage’, British Journal of Sociology, No. 4, Vol. 51, December 2000: 605-622. Koskela, H. ‘Webcams, TV Shows and Mobile phones: Empowering Exhibitionism’, Surveillance & Society, special issue CCTV Special, edited by Norris, McCahill, and Wood, 2 (2-3): 199-215. Le Maître, B. Entre film et photographie: Essai sur l’empreinte. Saint Denis: PUV, 2004. Lévinas, E. Humanisme de l’autre home. Montpellier: Fata Morgana, 1972. Lundemo, T. Quoting motion: The frame, the shot, and digital video in Film, art, new media: Museum without walls?, edited by A. Dalle Vacche. Basingstoke-New York: Palgrave Macmillan, 2012: 97-114. Manovich, L (ed.). Soft cinema. Berlin: ZKM/X-media, 2002: available at http://www.softcinema.net/pdf_files/catalog1.pdf. _____. Software takes command. New York-London: Bloomsbury, 2013. McGrath, J. E. Loving big brother: Performance, privacy and surveillance space. London: Routledge, 2004. Merleau-Ponty, M. Phénomènologie de la perception. Paris: Gallimard, 1945. Parfait, F. Vidéo: Un art contemporain. Paris: Regard, 2001. Tomas, D. Vertov, Snow, Farocki: Machine vision and the posthuman. New York-London: Bloomsbury, 2013. Wiebel, P., Levin, T. Y., and Frohne, U (eds). Ctrl [Space]: Rhetorics of surveillance from Bentham to big brother. Karlsruhe-Cambridge: ZKM/MIT Press, 2002. Wright, R. et al (eds). Dataesthetics reader: How to do things with data. Zagreb-Frankfurt am Main: Arkzin d.o.o./Revolver, 2006. Cf. Bentham 1791; Foucault 1975. For a more recent examination of the theme and its relationship to cinema and visual arts see Wiebel & Levin & Frohne 2002. A recent reference partially associating this issue to Farocki’s work is provided in Tomas 2013. It is impossible to reconstruct here the rich literature available on the concept of the trace as a sign. Seminal contributions are Derrida 1967, 1972a, 1972b; Lévinas 1972. These surveys represent the explicit and ultimate aim of such mechanisms, as it is made clear by Fuller & Goffey (2012) in their study of data structure. http://www.farocki-film.de/gmusik.htm, (accessed on 30 January 2013, my translation). Farocki’s research on operational images is not limited to Gegen Musik but rather encompasses several films and installations released in the last decade. In Auge/Machine III, for example, he states: ‘[m]any operational images show colored guidance lines, intended to portray the process of recognition. The lines tell us emphatically what is all important in these images, and just as emphatically what is of no importance at all. Superfluous reality is denied – a constant denial provoking opposition.’ The denial of the physical world calls into question what Farocki considers the loss of authentic images. He writes, ‘[t]he computerized images of war extinguish the difference between simulated and real events, the difference between historical time and technically/electronically simulated time.’ Farocki 2002, p. 423. A similar process is to be found in Lev Manovich’s project Soft Cinema – Ambient Narrative (2002-3), where the author adopts an analytic method based on Eisenstein’s theory of audio-visual montage that assumed the idea of ‘musical counterpoint’ as a basic notion. Haggerty & Ericson 2000, p. 613. Thomas Elsaesser also seems to agree on this point. In his volume devoted to Harun Farocki he associates the director’s research on the imaginary of seeing and the machinery of vision that somehow permeates his production to the invention of cinema and the subsequent changes in the way the eye perceives. For the full argument cf. Elsaesser 2004. McGrath 2004; Fuller & Goffey 2012, p. 96. Clarke 1994. The same trend was recently described by Lev Manovich as a ‘softwarization’ of culture. Cf. Manovich 2013. Such a model is not something solely typical of the context explored by Farocki in this work but is rather a suggestion which is to be traced back to Guy Debord’s La société du spectacle (1973). I owe this connection to Carmelo Marabello. A presentation of the authors’ artworks in relation to surveillance practice is available in Parfait 2001. Groombridge 2003, quoted in Koskela 2004, pp. 203-204. Ernst 2002, quoted in ibid. On the connection between desire and the production of an image in the form of an imprint, cf. Le Maître 2004. I use the terms according to the formulation by Michel de Certeau (1990). The tactical production of traces based on the conscious use of the surveillance device can also be seen as a form of sousveillance. Defined and recently refined by Steve Mann (2003; 2013), this category is a bottom-up practice opposed to the strategic, institutional gaze. I would connect this idea to the story of William Randall, as the performing attitude of the convict is supported by the desire to contrast the control element, challenging its system from the inside, as in sousveillance. In this sense the exposure to control devices leading to an exhibition of the self may be seen as a critique or a specific engagement of the observed subject, a real form of ‘counter-surveillance’. Farocki does not really take into account such mechanisms even though I believe a subtext dealing with possible reactions towards surveillance technologies and processes is definitely implicit in his work. Cf. Didi-Huberman 2001, 2002, among others. On the safety of the observer’s position, cf. Blumenberg 1997.